The storm has passed, but the cleanup has only just begun. As officials begin to assess the damage caused by Hurricane Sandy to New York City’s public transit system, all services in NYC remain suspended on Tuesday morning. This includes not only the 108-year-old subway system, which experienced substantial, unprecedented flooding, but also all bus services, bridges and tunnels, as well as all Long Island Railroad, and Metro North lines. As of yesterday night seven subway tunnels under the East River have flooded, in addition to commuter tunnels, subway stations, rail yards and bus stations. The storm has passed, but the cleanup has only just begun. As officials begin to assess the damage caused by Hurricane Sandy to New York City's public transit system, all services in NYC remain suspended on Tuesday morning. This includes not only the 108-year-old subway system, which experienced substantial, unprecedented flooding, but also all bus services, bridges and tunnels, as well as all Long Island Railroad, and Metro North lines. 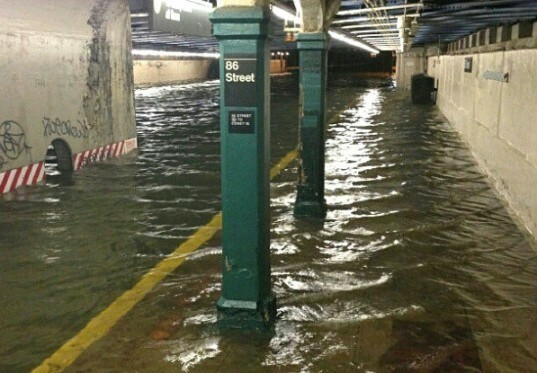 As of yesterday night seven subway tunnels under the East River have flooded, in addition to commuter tunnels, subway stations, rail yards and bus stations.